College kids love the care packages that their parents mail from home. But what happens when they rip open a box to discover that the goodies have been sent from someone else’s mom? 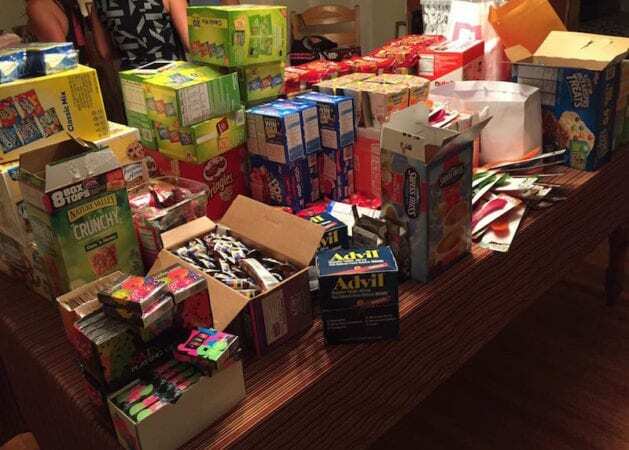 Forty kids, all graduates from Ridgewood High School in Ridgewood, New Jersey, were treated to a surprise this week when their moms gathered together for a college care package party. Their mothers picked names out of a hat, assembled a box of treats, and tucked in a personal note of encouragement to a freshman who was not their own kid. 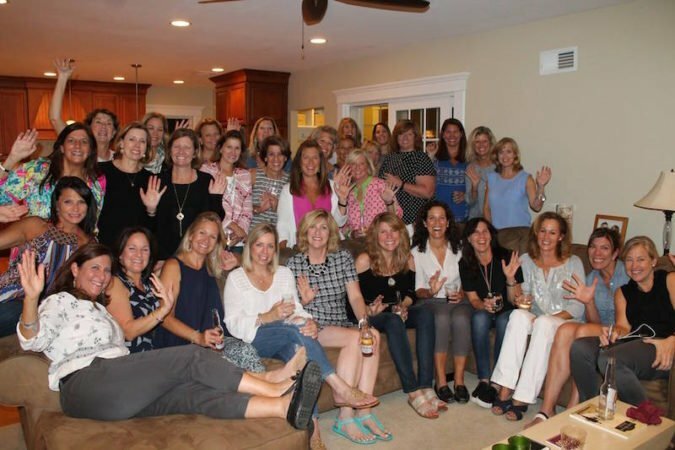 Angele Kassar Ekert, a mother of two college kids and recent empty nester, was the mastermind and she invited, in her words an “eclectic” group of mothers from among the class of 450. Her invitation read “My Kid Left for College and I Need a Drink” and she asked the invitees to bring 40 “somethings” – inexpensive gifts or snacks that a college kid would appreciate – along with their own teen’s mailing address. Some invitees were close friends but many were mingling with moms whom they had never met. (Ridgewood HIgh School enrollment is 1800.) Her plan was to include people who she thought would enjoy getting together to toast the kids, prepare a box of goodies, have a glass of wine and enjoy a few laughs. The college care package party invitees placed the treats on Ekert’s dining room table and gathered what they wanted for the kid whose name they chose. She had purchased note cards with a star motif for each person to write a few words on. Before they left, Ekert took a picture of the group and made copies so everyone could include the photo, too, in each box. One college girl texted her mom, “My week is made. I was already having a good day but now it’s even better.” She included a picture of the all the varied gifts she’d received, the note and photograph, all spilled out on her dorm room bed. Frisbees, Advil, coffee cups w/Keurig cup, cup o noodles, spoon/fork/knife combo, ear buds, deck of cards, Emergen-C, granola bars, candy, cookies, chips, hot chocolate, Nutella, and Rice Krispie Treats. All left over snacks were donated to the local food pantry. College Care Packages From Home: 50 Great Ideas!